One hour 15 minutes from the start of preheating to this food on the table. Today I used the pressure cook setting on my Instant Pot for the first time and it was a success! 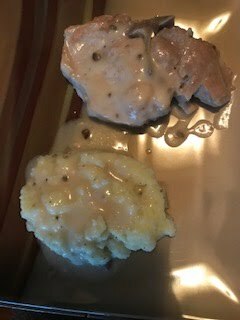 The picture shows a pork chop in gravy with a side of mashed cauliflower. Both were delicious. (The cauliflower wasn’t cooked in the Instant Pot.). The chops were the first time I have ever prepared really tender pork chops. I am pleased with my new pressure cooker. What do I make next time?